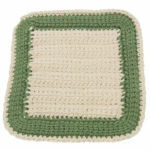 Cone Towel Topper -- $1.99 A Crochet pattern from Julie A Bolduc. This towel topper is made by making a cone from the bottom up then it is sewn to the top of the gathered up towel. I made both in just about 90 minutes.